Tim Parkin and David Ward overran the predicted hour long discussion on the ins and outs of lens quality and testing but with such a lot of ground our listeners supported our flagrant ignorance of temporal limitations. With lenses costing so much itís pretty important to make the right purchasing decision but how can we do this without trying all of the possibilities out ourselves. Well there are always those in depth tests we often see in magazines and online. 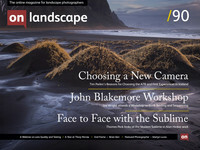 But there lies the problem - how do we know what these tests mean and are they relevant for the landscape photographer? Watch the video for more! You'll need to be a free or paid for subscriber to access the video content. To register for a free subscription please click here. For paid subscribers you'll need to login.